The school year is nearly upon us. The kids are ready. The parents are ready. The books aren’t quite covered yet. My family are very lucky to be part of a warm and welcoming school, and am so thankful for the wonderful parents that surround my boys. This year, I promise to live by the School Parents Creed. If I have a problem with you or your child, I will talk to you, and only you, about it. I embrace diversity and think our differences are what make us beautiful. I will be an example of tolerance and acceptance for our kids. I will be well-mannered and kind because our children notice what we do long before they take note of what we say. I will talk to you about things other than my kids because I am an interesting person. You have my permission to pull up my child if they are doing the wrong thing. I will look out for your kid. I will celebrate your child’s successes with you and when things are rough, I will offer understanding rather than judgement. I am grateful for what you do for our school. I know that families have differing amounts of time to dedicate to the school community and no matter how large or small your contribution is – it matters. I will not enter into mummy wars, daddy wars or battling for sheep stations on the sporting field. My child is the light of my universe. Your child is the light of yours. Our teachers have a whole galaxy to contend with. I will cut them some slack and understand that my child is one of many. I won’t expect my child to be invited to every party or event. Or to win a ribbon each time they compete. I will teach them grace in the face of disappointment. I won’t stereotype you as a certain kind of school mum or dad. I won’t compete with you. I will respect the way you choose to parent. For the sake of our children, parents and teachers. Are you looking forward to the school year ahead? 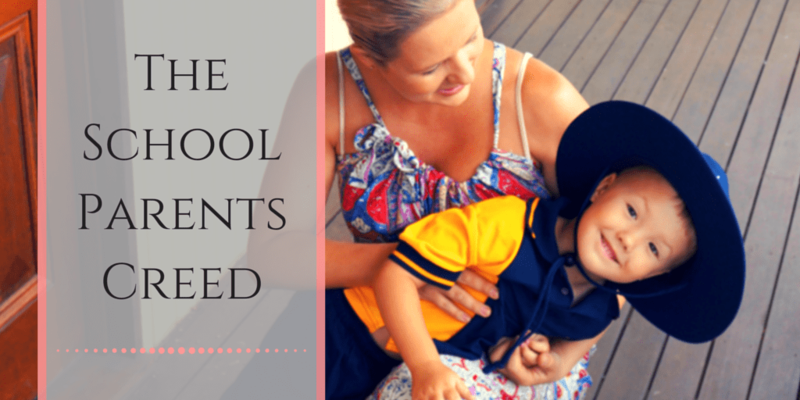 Are you part of a supportive parent community? Thanks Lisa – I feel lucky to be part of school where the parents I know all abide by the creed. This is sooooo good (and so humbling… even the first point applies to any situation and anyone, not just parents). My little one isn’t in school yet but I am bookmarking for future reference. You should make this a printable! Aw thanks – I might just do that! Thanks for popping over. Especially love the galaxy line. I have nothing but respect and admiration for teachers. What an amazing job they do. Don’t they? I spend an hour or two in the classroom helping and my respect doubles.